“I came to Desert Hot Springs in May 1946 along with Paul Price. May 3, 1947 we opened El Pueblo Market at Palm & Cahuilla. 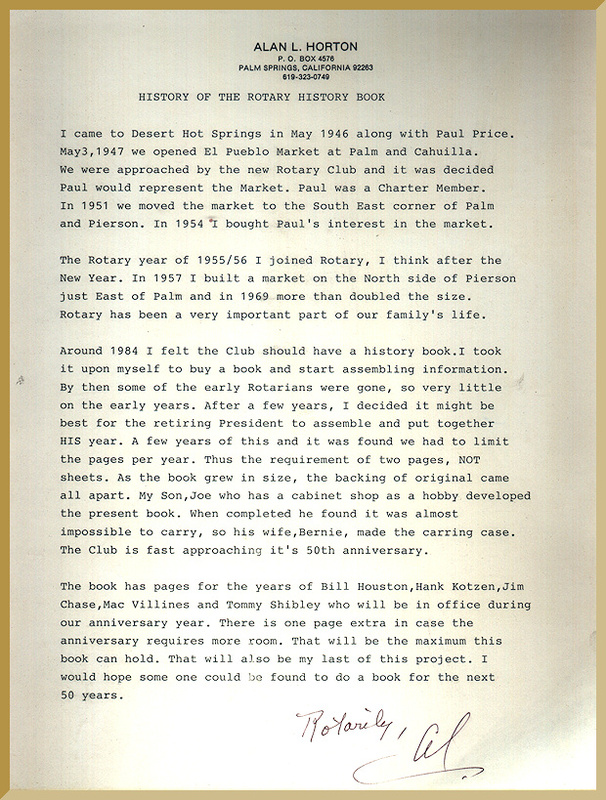 W were approached by the new Rotary Club and it was decided Paul would represent the Market. Paul was a Charter Member. In 1951 we moved the market to the South East corner of Palm & Pierson. 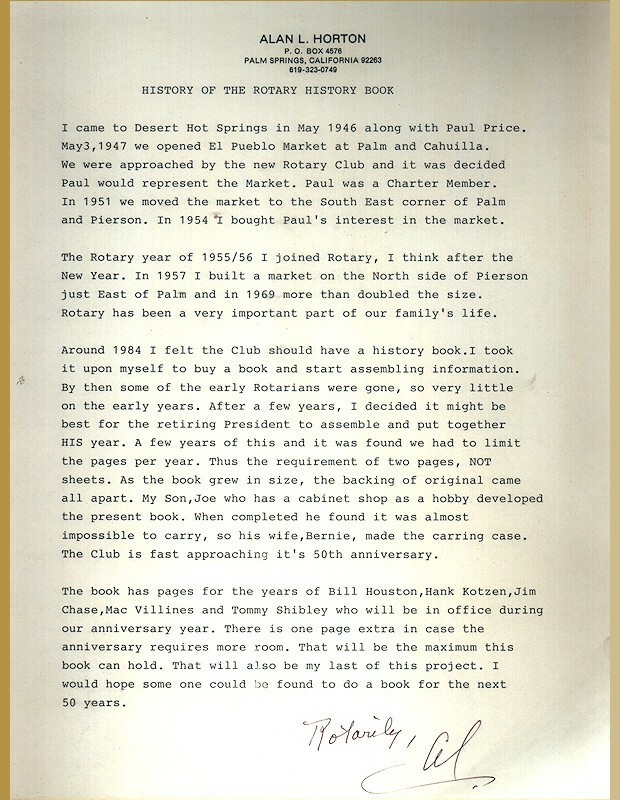 In 1954 I bought Paul’s interest in the market. The Rotary year of 1955/56 I joined Rotary, I think after the New Year. In 1957 I built a market on the North side of Pierson just East of Palm and in 1969 more than doubled the size. Rotary has been a very important part of our family’s life. Around 1984 I felt the Club have a history book. I took it upon myself to buy a book and start assembling information. By then some of the early Rotarians were gone, so very little on the early years. After a few years, I decided it might best for the riting President to assemble ad put together HIS year. A few years of this and it was found we had to limit the pages per year. Thus the requirement of two pages, NOT sheets. As the book grew in size, the backing of the original came all part. My Son, Joe who has a cabinet shop as a hobby developed the present book. When completed he found it was almost the impossible to carry, so his wife, Bernie, made the caring case. The Club if fast approaching it’s 50th anniversary. The book was pages for the years of Bill Houston, Hank Kotzen, Jim Chase, Mac Villines and Tommy Shibley who will be in the office during our anniversary year. There is one page extra in case the anniversary requires more room. That will be the maximum this book can hold that will also be the last of this project. I would hope some one could be found to do a book for the next 50 years.